Ah, California! Home of so many wonderful things: Showbiz, tech, diversity, top-notch universities, surprisingly even their weather (take that, New York!). But one thing that shouldn’t go amiss are some of the mesmerizing natural beauties, and these include some amazing rivers and lakes. Water really is like the Yin to California’s Yang, because some of the watery areas have lush greenery and wildlife. Especially wildlife in the water, which is probably what interests you. And you will probably be glad to know that some of those are rich in all kinds of freshwater fish. So without further ado, we’d like to take you on an adventure. Let’s look at the top 10 best fishing spots in California! This happens to be the standout on this list, and we can see why! The San Joaquin Delta is located all through California because it runs through the place. Apart from being the kind of scenic beauty that is sure to take everyone’s breath away, it is also a great place for fishing. There are all kinds of fish running through the water, including catfish, stripers, King Salmon, common carp, steelhead, bluegills, heck people found a whale there once too! The most common of the lot, of course, is bass. In fact, there are so many that bass literally can be found for hundreds of miles at a stretch on the entire thing. During the months of May and November Striped Bass migrate through the delta as well, but the other fish are found all year round. You can find catfish there too, more specifically the bullhead, channel, and white catfish. These, of course, can be found in a wide range of depths, so expect to find them in Franks Tract State Rec Area, Middle River, Old River, and the likes. Half an hour of fishing should be enough to find one. Sturgeon can be found in the deeper areas, but the rest are quite easily found. The ease of finding fish combined with an abundance makes this number one on this list. The Clear Lake State Park is another beautiful work of nature to behold. The water looks beautiful towards the middle, and of course, fish are found in the numbers. So much so, that this has now become a favorite spot for fishing contests, especially for bass fishing! In fact, professional bass fishers call it the best lake for fishing bass in the U.S. When you consider the fact that 19 of 25 of the largest bass have been from Californian lakes, you have to admit the odds look really promising. The largest largemouth bass ever caught in this lake is 17.52 lbs. There are areas where fishes throng the water, especially the larger fish, such as Berger Bay and Kelsey Creek. Aside from the bass, you can also find the usual fishy suspects- catfish, crappie, bluegills, and carps. Another great part about this is that you can fish in many areas around the part. Apart from areas where people swim or boats are docked, or from vehicle bridges, you can pretty much fish anywhere you want. This includes the creeks around the park, footbridges and even the Kelsey Creek Campground. And if you need to unwind after a long day’s fishing, you can get fine wine in world-class wineries nearby! This is another place of abundant scenic beauty and abundant fish grabbing potential. The unique part of this is that it is made up of around 770 miles of water streams and mountain lakes. You can fish on still water all throughout the year, while rivers and streams get a grace period between November and April. 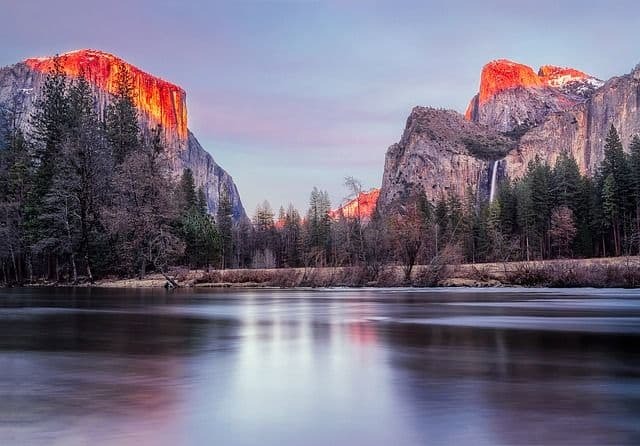 The interesting thing about Yosemite is that over 33 million fish have been put onto its water in 103 years, ending 1990. Because of this, fish are found in extremely large numbers. With respect to nativity, many outside species of fish have been put into the water during the planting. Natives of Yosemite’s waters include the rainbow trout, California roach, Sacramento Pikeminnow, Hardhead, Sacramento suckers, and riffle sculpin. These can be found in varying elevations, but mostly in lower elevation regions, between Merced River to as far as El Portal. That is why all the outsiders have been brought in for the areas located higher up. These include several types of trout and smallmouth bass. There are primarily 7 frequented fishing spots, each with their own unique blend of fish that is waiting for you to catch them! The McCloud River is probably the best in terms of natural, aesthetic beauty at its finest. Maybe that’s why it isn’t the best because people admire it so much they lose focus on the fishing! It is a rare occurrence of having an underground aquifer as the source, where water from the aquifer squeezes out onto land. The ideal fishing season here is Fall, right after caddis hatch and during migration season. Of course, the river is also segmented into two, with an upper portion and a lower portion. Upper McCloud is where the magic happens, but Lower McCloud isn’t bad by any means either! In Upper McCloud, you get much of the beauty. However, it does home some of the smaller fish, especially trout. We pointed out the divide because Upper McCloud is way easier to catch fish in because there are no rules and the water current is slow enough to take a dip too. Going up the river you can find a waterfall, beyond which lies a unique trout named McCloud River Red Bands. Lower McCloud has the big fish, due in part because the water is deeper, faster and inconsistent. But since you are here for the fish, this is where your fun will begin! Lake Shasta is one of those places where nature’s overwhelming dominance in size over humans is clear to see. Amid the stretch of seemingly endless stretch of water, forest, and hills, it is easy to forget about the inhabitants of the water below. The lake is abundant with fish, with many types of fish inhabiting it including king salmon, panfish, carp, and catfish. In addition, over 30,000 pounds of rainbow trout are put into it every year, although it also has brown trout living already. The lake is full of rivers and streams that stretch out quite a bit, which is why using a boat can be very beneficial for fishing here. In fact, there are so many of them that the points to fish from appear endless at times. A good starting point is near the dam, trails, creeks, and the bays. With respect to doing the actual fishing, shallow waters are a good place to start. This is where many of the trout can be found eating shad. Low depth regions such as Jones Valley are good for this. You can also look for rainbow trout and salmon by Shasta Dam. Lake Cuyamaca is a 110-acre lake that sits atop the Cuyamaca Mountains. Because it sits perched up so high, the entire climate for the lake is quite unique. It stays cooler than the rest of the lakes most of the time, and really chilly in winter. What does that mean? This means it is the only source of trout for San Diego County all throughout the year. You also get a whole bunch of other fish, including decent sized bass (though not the massive ones), including smallmouth bass, and even sturgeon in some parts. You also get some black crappie, bluegill, bullheads, and channel catfish, though they tend to be small in size. The most dominant one is the rainbow trout, planted by the Park and Recreation District annually. The sturgeon has fared quite well too, with some being over 20 pounds. The best part about it is the fact that you can pretty much camp right by the lake towards the North. You can also find a restaurant in the West, some tackle stores and even a small shop. Not bad for something 4,620 feet above sea-level huh? Some of the best places to fish are California’s piers, and the Santa Monica Pier takes the cake. Apart from the view from the pier, you will like hearing that you can fish on it without a fishing license. In fact, it goes for all piers in California! Now, most people are tempted to fish directly from the pier itself. It seems obvious, great view with a good reach. But there is also a lower deck made specifically for fishing which is closer to the water. There are several species of fish available, including perch, mackerel, white and black sea bass, leopard sharks, tiger sharks, and stingrays. Do note that the black sea bass can be caught, but has to be returned back (The species is facing extinction). 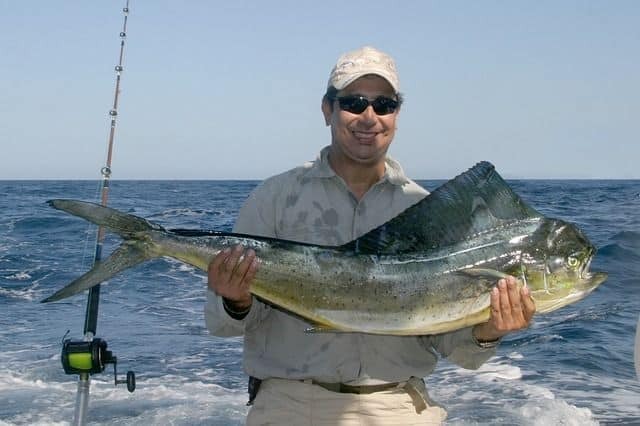 Additionally, you can also find fish deeper into the water, including yellowtail and barracuda, but you would have to be quite good as fishing to catch them. You also get a whole bunch of facilities nearby, so fishing doesn’t have to become a long-drawn chore. The Clear Lake, located in the Center-North of State in Lake County, is a massive 44,000 acres of water, making it California’s largest freshwater lake. It is quite open, and you have many fishing points to choose from. What makes this lake so good is the fact that the water remains fairly warm all year round, is not very deep and is full of nutrients which make it great for fish. The most abundant warm water fish here is bass, with so much of it available that bass catching tournaments are held every year. Of course, you can also find other common fish like bluegill, catfish, carp, and crappie on it. Given the geography of the lake, you can find fish around Lakeport, Berger Bay and Kelsey Creek. You could also look around Redbud Park, Library Park, and Rodman Slough. The great part is that so much fish is available close to the shore that you don’t even need to boat towards the middle. Plus, there are many places to drink wine close-by to relax after a good day’s fishing! We heard so much about bass and trout so far so Smith River will be a good refresher on this list. It is basically the best place for salmon and steelheads on the West Coast. And with 25.1 miles of the river to traverse, there is ample space to find them. Also heralded as one of California’s most beautiful rivers, the river is famous for having some of the largest steelhead and salmon. The largest steelhead was 27 pounds heavy, and the largest salmons easily weigh in the 50s and 60s in pounds. The salmon breeds throughout the wet seasons, so fishing for salmon begins before winter, around September up to December. January onwards you can fish steelheads all the way up to April. This is frequented by these fish because it is located in the wettest place of the West Coast. Because of this mating season leads to many offspring which replenish the ones caught annually. There are also local towns near the river for refreshments and entertainment. All you need, really! To end this list, we have a unique lake in all manners. Fish aside, not only is it an artificial lake, but it is one with sporadic fog in places. As for fishing, the fishes primarily found are rainbow and brown trout, king salmon and smallmouth bass. You also get some of the others, such as catfish. The lake is set in a manner where it is almost divided into two by a piece of land. Fishing begins full-fledged in spring, with catches on both sides of the divide and around the Big Springs Cove. The great part about this lake is that much of the fish can be caught from the shore itself. It is quite a big lake, mind you, and with the fog, in the way, it does get difficult trying to fish in the middle. It is also a good place for night fishing, especially to get good-sized salmon. There are also certain facilities in and around the lake. And if you are new to this, I recommend taking a fishing guide. There are many available. All in all, California has some great fishing places, all of which will first wow you with natural beauty, and then fill your fish baskets with some large and rare fish. If the view isn’t good enough for you, the fish certainly will be. And in some cases, you can have a good time as well!